I've written before about my love for Tozi, a brilliant Italian tucked away in Victoria. Their friendly staff and brilliant cicchetti (small plates) have boosted it to a firm favourite and a definite recommendation in my repertoire. This spring, they've been seeing in the 70s trend with a range of Flower Power cocktails for a taste of Italy with a nostalgic floral twist. 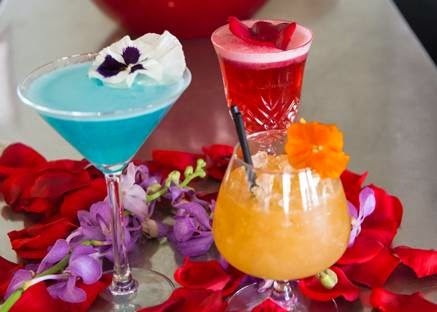 A little bit brighter than your average, these cocktails are designed to whisk you away to a Mediterranean mirage (even if the blue one does look a bit scary!). The Italian in Brazil (the pink one in the back) was my favourite of the bunch as I'm going through a bit of a campari phase at the moment and it's super easy to make. Pour the campari, mango puree, lemon juice and simple syrup into the shaker. Strain it in a flute glass, top with soda water, add the flower and drink! Super simple but if you fancy taking it easy and watching someone else make it for you, you can get with the groove and catch these cocktails at Tozi until June.